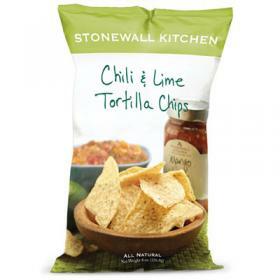 Stonewall Kitchen Chili & Lime Tortilla Chips are authentic, all-natural crispy chips made with whole kernel corn and finished with lime and chili spice seasoning for layers of delicious flavor. Originally a handmade Tex Mex classic, these chips are now a snack-time staple everywhere. Perfect with SWK guacamole mix and salsas.